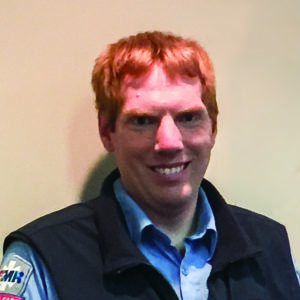 Tim Hoffman has been a dedicated AMR employee for over 12 years. Tim grew up in Holland, Michigan and followed in his father’s footsteps becoming a Paramedic. Tim’s father, John, is also a Paramedic who works for AMR in Holland, Michigan. Tim started with AMR as a wheelchair van driver on August 16, 2005. He worked through school and became an EMT, then a Paramedic, and finally a Critical Care Medic. Tim has had nearly perfect attendance throughout his employment. Tim frequently volunteers for charity runs and local community events. He is easy going, well liked, warm hearted, and always has a big smile. Early in the morning of August 7, 2016 everything changed. Tim and his partner Kevin Jongekryg were on duty and at approximately 4:30 a.m., as they were driving through a rural coverage area, they were hit head on by a drunk driver. Tim was in critical condition with a devastating head injury. On Monday, January 29, 2018 Tim returned to light duty work at AMR. He has verbalized that he loves to “help people” and still wants to be able to help in any way he can. Tim will always have that “care giver” spirit that sets apart our AMR employees. It is wonderful to see how excited Tim is to be back in his uniform and working in the building. Tim is still the same easy going, warm hearted, smiley person, that he was before. Tim is so proud to work for AMR and we are so happy to see how far he has come.